Aarsun Woods presents you Handcrafted Wall Mounted Wooden Mandir / Temple. 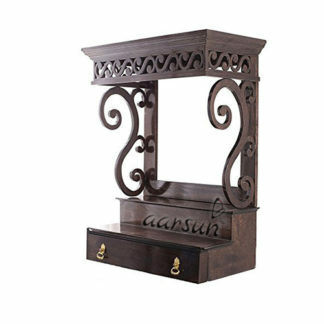 The unit is made by skilled artisans from seasoned Sheesham Wood with traditional finish. The unit consists of a drawer in front for pooja essentials and Floral Pattern at the top. The unit can be placed at the table and can be mounted on the wall. Wall Mounting provision has been made at the back of the Wooden Temple. For any other details, feel free to contact us via Amazon Messaging Service so that we can discuss this in detail. We are the manufacturers and the unit can be customized exactly as per your requirement. Please Note that as the unit is handmade, a slight variation in color and size may occur.